Junk Food Jones: National Hot Dog Day! That’s not some Photoshopped monstrosity, that’s a real-life monstrosity: The Hot Dog Stuffed Crust Pizza. Yep. 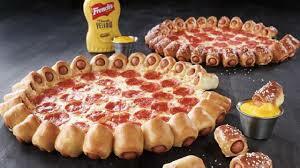 Those crazy bastards at Pizza Hut done went and surrounded a pizza pie with a ring of pigs-in-a-blanket. I know it looks like some sort of Frankenstein-level abomination but before you round up the village mob and start passing out the torches and the pitchforks think about this for a minute: There’s no bigger waste of junk food real estate than the outer ring of pizza crust. When she was little, my sister referred to that part of the crust as “the bone” because, like a chicken leg, it was the handle of the food, not something any sane person would actually try to consume. Over the last several years there have been attempts to solve the problem. Most of them involve jamming some cheese in there. Meh. That’s just bad cheesy bread. I’ve been waiting for someone to push the envelope a little, Chuck Yeager-style. Pizza Hut did not disappoint. Hot dogs don’t really go with pizza, maybe, but you’ve gotta take a big swing if you want to advance the art. (Clearly I like mixing metaphors. Maybe that’s why mixing junk food doesn’t even phase me.) I was excited to place my online order for one of these things. I couldn’t wait to dig in. What the hell? Little crappy crescent rolls with some congealed mozzarella forced inside? So my National Hot Dog Fake Holiday was a bust. Now I’m pissed at the local Pizza Hut. I’m thinking about trying to rally my fellow villagers and heading on down there. Who’s with me? It’s B.Y.O.P.F. (bring your own pitch fork.) Let’s do this! We’ll be the first angry mob to ever torch a place for not creating a monster. That’s not as crazy as eating a hot dog stuffed crust pizza but it’ll still be a Hot Dog day to remember! They had this pizza in Japan first. Pizza Hut Japan made the Double Roll. Japanese pizza is already (usually) a monstrosity, at least for the "popular" toppings like tuna, mayo, corn and onion. But just imagine that with a ring of hot dogs baked into the crust on the outside.